The simplest possible diagram of orbital alignement (degrees) of comets between 200-2000 AU (average), just because en.wikipedia was missing this. 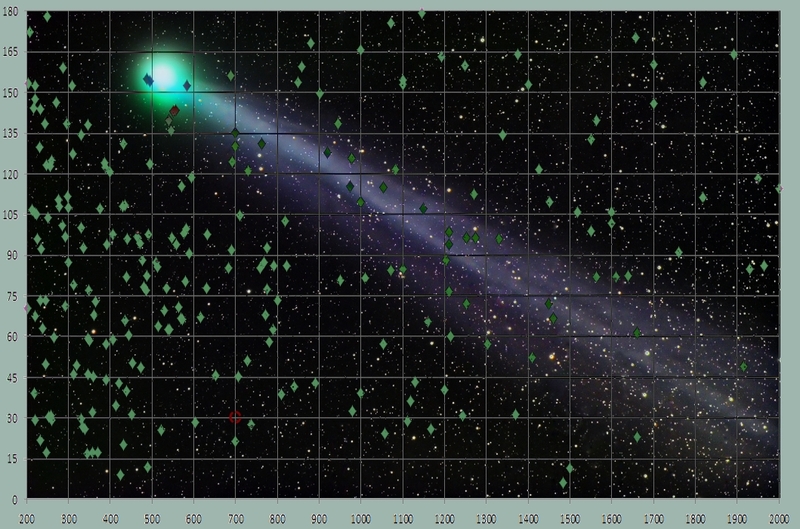 There's likely some observational bias here, as I believe the comets are easiest to find near the celestial north pole. It's pretty easy to point a wide-field telescope towards Stella Polaris, and take an overnight shot or several. Comets would show as ripples or lines curving out or in between the regular arcs of normal stars. As there's still not a push to convert the metric system to a natural unit system, mind you, because of quite good reasons, it might be best to stick with the SI-unit system. Though this system doesn't base itself to any universal physical constant, it can (by definition) be derived from these. At least it should be. Currently the physicist are guessing that between 19 to 26 constants are present in universe, not accounting the possible constants associated with dark matter and dark energy. Many of these are of no use in normal human interactions. It's also clear that a system based on these would need to be normalized to be usable in human context. F.e., I could say I'm 1,126077784 * 1035 Planck lengths tall, but why not say this with simpler numbers and say I'm c. 6 feet. We might take 1035 Planck Lenghts as our base unit in such a system to get on human scale (this would be ~161,6 cm aka ~5 feet 3⅝ inches). The metric system might also need refinement, as the base of all metric measures has been changed over time. F.e. metre is no longer a 1/10'000'000th of the quarter of the distance round the globe via poles, but something to do with wave-particle frequencies in a theoretical perfect vacuum (oops, quite not so), making the exact metre accessible to only physicists and their imagination. But it must be agreed that this distance changes also by natural means, heavy earthquakes and such large mass movements shape the earth. These natural phenomena and the measurement errors present in the late 18th century make the current meter ~0,1478% too large for the original definition. Still, many countries use the SI-based system of measurement. This is of course no problem as long as the numbers we get can be converted to natural units. It just wouldn't be prudent to say to an alien, "I'm 1,82 meters". Or maybe it would, but she/he/it wouldn't understand. She/he/it might also decide I'm too Earth-centric to live. Thus we might use multiples or fractions of natural units as a base. I guess this is not a large problem currently, but soon might be. The headline of this post is of course inspired by the you-know-who, with the exception of changing the noun to the correct one (MUGA instead of MAGA). Many of you have likely already guessed what the post is about. That is, the incompatibility between the historical, anthropogenically derived units of measurement and the almost scientific SI-system. The reason why I say "almost" in this context should be obvious to math and phys students, this is of course the nature of universe in which there are no irrational numbers (as far as we can know it). F.e. we need 62 decimals of π to calculate the circumference of the universe to multiples of Planck lengths. Planck length is about the shortest accepted length within the framework of quantum physics (without considering black holes) so this number of decimals should be the only ones needed. Still, mathematicians can live on their imaginary Euclidian Plane and calculate it much further. π to 62 decimals is 3.14159265358979323846264338327950288419716939937510582097494459 and the physicists won't need to blow up their computers' math processors. There are a whole bunch of these numbers not existing in the universe, as any mathematician may tell you. Heck, there is even a number j for which j2=1, but j≠1! The things people dream up. The whole shebang above of course means that ∞ and 0 would exist only in our imagination, or at least be even harder to define than now. Alternately, we could define "universe = 1", and all the numbers we use would be fractions of this, but this is veering to ontological questions and the foundations of mathematics, so I better leave it alone. F.e. the situation where you have 0$ wouldn't exist, but instead the bank might say you have ε$ on your account (1st definition). As there are no coins of this size, the real life effect would be the same. This would instantly make US at least 0,5% greater, and for the bolder of you, who would convert to the 'new' mile of 1500 m, a whole 7.2896% greater. This would mean the mile-run records might be made greaterer and areas would similarly be huge'er by far. Similar adjustments could be made for weights, like, pound is half a kilo, so everyone would feel less fat (c.9%) afterwards. I'm not going to go through all the conversions required to MUGA, but you really should change the gallon to be 3,75 liters so you'd get more gallons per buck. Some additional suggestions for conversion factors may appear on the page later on the blog after I figure out what the odd electric voltage you guys use means for electric bills. If you feel this is a cheap trick, consider that you use an imperial system, despite having a two-party democracy and a president (of sorts). 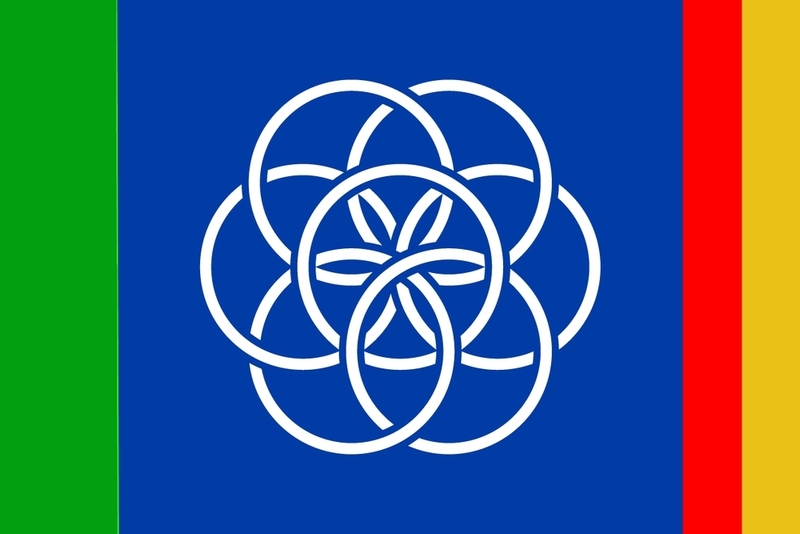 Mod of one proposal for the Flag of Earth. Afro-Eurasia, Gondwana (alias Australia-Antarctica), and America, the Seven Seas in blue. The significant problem with the map described above is, that J.R.R. Tolkien, the Translator, has on several occasions stated that Shire is located approximately along the latitudes of his European home. On the map pictured above, England and it’s various –shires are though situated way too much to the south of the true location. The Shire we’re seeking for would seem to be in the deep hug of the North Sea. I’m somewhat hesitant to propose the following, knowing the attention to distances traveled given by the translator of the Thain’s Book. What’s more, huge areas of Eriador are also sunk in the map. This likely cannot have happened without an extensive intervention by the Powers. We might think they’ve relocated most parts of it elsewhere in the Middle Earth, but then it cannot be explained how “hobbits may still be found on areas they’ve always lived.” By this reasoning I’m speculating that J.R.R. 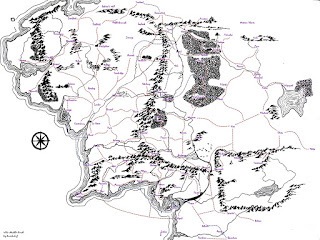 Tolkien used at least two different scales when he was translating the map of the Middle Earth. Might it be, he has used ‘the mile of the hobbits’ while drawing Eriador? We can decipher the length of ‘the hobbit mile’ rather easily (;-)). The current British Mile (1609m) has been created from the natural lengths of humans. The length of a thousand paces is relatively easy to count even by hand. Thus, in earlier times, the true length of a mile has been dependent of the terrain. The more difficult terrain is, the shorter miles we have. Still, the experienced orienteers can estimate their travelling distances notably accurately in the number of paces between the controls. That is to say, they know their pace-lengths in various terrains. And they make a difference between walking-paces and running-paces. In the times of Middle Earth, this skill would have been well developed in all persons travelling long distances. The height of an average hobbit (3½ feet) and human (5 ¾ feet) gives us an approximation of their pace lengths. Thus we get the ratio between ‘the hobbit mile’ and a regular mile to be approximately the same as in the previous calculation between kilometers and miles, namely 0,61. Thus we could imagine the British Isles to be projected c. 2,6 times larger than Europe (1/(0,62*061)). Tolkien was an Englishman, but a catholic. Thus it was natural for him to use miles instead of kilometers describing distances. That he was a member of religious minority in his native country, the Anglican superpower of Great Britain, might have influenced to the fact that the areas assigned to England seem to be way larger than the rest of the Europe, on the maps of Middle Earth. Whatever the reasons, it appears that the measurements in Eriador seem to be about 4,1 times bigger (~1,6^3) than in the rest of the map. There is still an additional problem with projecting the British Isles to the map of the Middle Earth. That is of course, there’s nothing in the Middle Earth resembling the English Channel, or North Sea, for that matter. I cannot offer any better solution to this problem, but that the Professor has decided to omit this for literary purposes and the demands of the storyline. The travel along the North Sea would have undoubtedly have been exciting, but how could the black riders travel along the seas controlled by Ulmo? Thus it is reasonable, if not entirely prudent, to seek a way to connect an enlarged map of British Isles to the map of Europe so the sea in between is the smallest possible. This may be achieved by rotating the enlarged map of British Isles some tens of degrees clockwise. 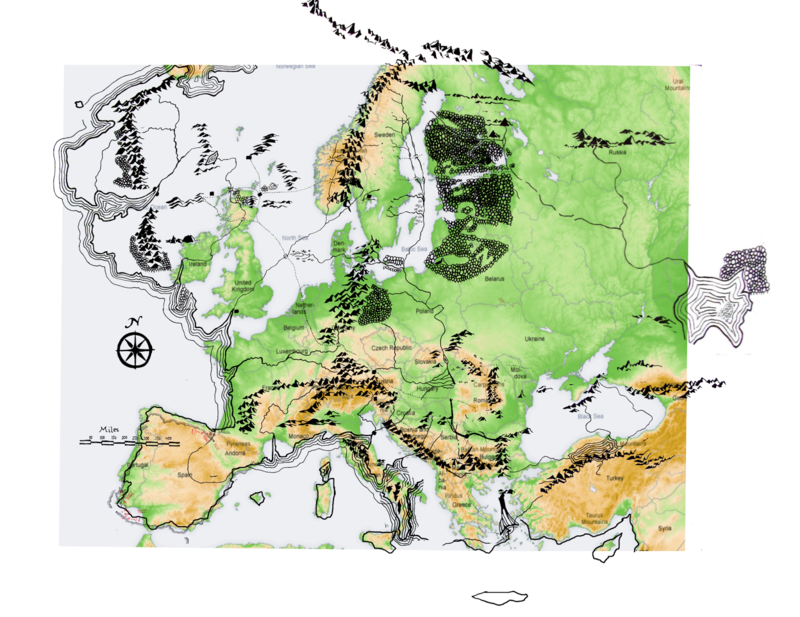 And here we finish our projection of Middle Earth to Europe. The differences between the shapes of Cornwall and Wales and the respective parts of Middle Earth may be explained by the distortions in the projection, but proving this is beyond me. This projection changes the distances travelled by Frodo and companions quite a lot, especially the trek between Sarn Gebir and Mordor, and the chase of Orcs across Rohan by three companions seem unnaturally fast, but might it be the Translator of the Book of Westmarch has left out the uninteresting parts of the journey? I do not know why J.R.R. Tolkien would have thought Scotland as the Northern Waste, but for Ireland, that’s out of the projection, I might have an explanation. Numenor was the pinnacle of civilization in the Middle Earth of Men, but this was lost. It was located way more to the south of where Ireland is now, possibly somewhere on the latitudes of Iberia, where the ancient peoples of continental Celts and Basques lived. Looking at the world map today, on this latitude we find the Azores Islands. Ireland might have been part of these, and be resurfaced and relocated by the continental drift described in the previous chapters. I have not drawn this to the map as this interpretation isn’t supported by any previous attempts in the projections of Middle Earth to Europe. It could be Ireland is just a new island like Numenor was. Laichalaf says he’s also done some drawing and claims artistic license. This is only natural. Frodo Baggins, who is assumed to be the drawer of the original map, would have naturally concentrated to the areas he himself had seen. No doubt there were better maps of elvish make extant even in those days, but as we do not know the extent of library of Bag End, we cannot know if Frodo had these at his disposal. It could be that the elves would have kept the details of these secret, to keep their meeting places out of common knowledge. It could also be they didn’t have any more detailed maps but would have remembered the details by oral tradition. In any case, it is possible that the map is entirely a work of Frodo the Hobbit. 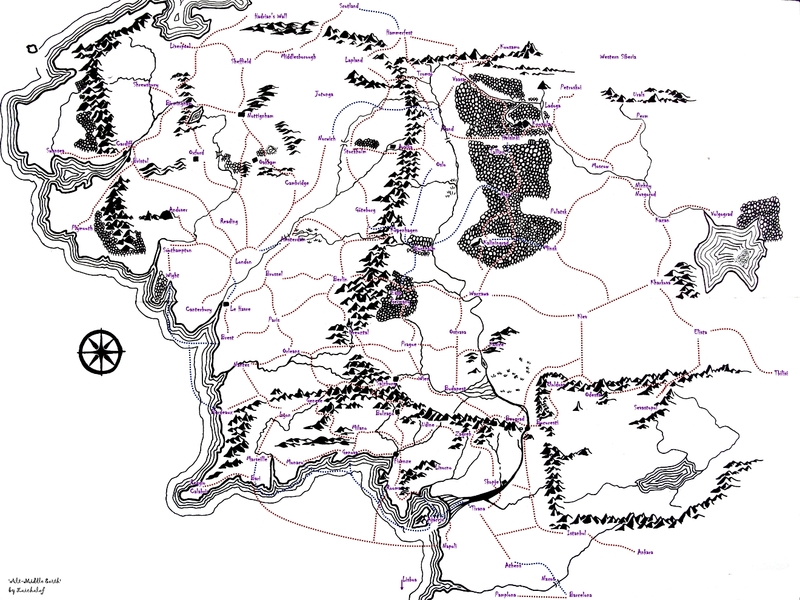 It could be even the coastlines of Middle Earth have been drawn from memory of some Gondorian or Rivendellian map. There’s little doubt he knew the Ea(rth) was made round (Ea r(ounde)th) when Aman was taken to another planet, the friendship between him and Aragorn and Elrond would have pretty much guaranteed this. This presents some problems in drawing maps as most educated people today know. 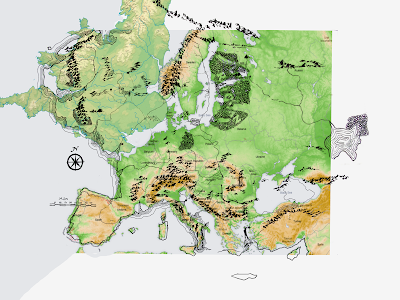 It looks like that notable cartographic distortion can be found on the maps of Middle Earth. These entirely normal errors in making maps are generated when transposing the surface of a ball to the 2-dimensional flat surface. This cannot be done so the finished map would retain areas and shapes and directions accurately. On the maps of the Middle Earth, the patterns of distortions are not entirely clear to me, and I gladly leave this task to some skilled geographer with good knowledge of maps and their projections. What I can say, is that the distortion is evident at least in the east and north of the map. Partly, the distortions might be a result of uncertain information, we really do not know much of these areas. Only Aragorn and Curunir have been known to travel far outside the areas we know. In the normal 2-d maps of earth, the areas near the borders of the maps change shape, they might twist and get seemingly longer or shorter, fatter or thinner. Also the distances between locations here get altered, so many many maps abandon the distance scale all together. Nowadays though, we can express an area the size of Europe pretty accurately in distances and directions and shapes by using fe. the trimetric Chamberlin projection or equidistant conic projection, but the calculations involved are quite fiendish to do by hand (they’re not easy even with computers). Of the persons in third age there are but few scholars during the Age of Kings in Gondor, in addition to Curunir, who might have managed to draw and solve these. Acquisition of accurate distance measurements from all over Endor would still have been difficult. We may thus assume J.R.R. Tolkien, or the drawer of the original map of Middle Earth, has used a projection that has been more simple to produce. These are plenty, and it might never get solved, which the projection exactly was. We though may note, that the rivers of Celduin and Carnen far-east in Middle Earth conjoin pretty much like Volga and Kama rivers in Russia. Their alignment on maps resembles the route taken by Vikings to the Constantinople, so the connection to medieval Europe can be found. Has there been Northmen in the Kingly guard of Gondor? The answer might be found in the remaining archives of Gondor. Assuming the north parts of the maps are similarly condensed, we can show that the Misty Mountains reached further north and the Lake of Rhun located further east and south. Also, the Iron Hills may be located very much to the east of the conventional thought. This east-north-south distortion conveniently locates Erebor much more north than we usually think. Its location now though would be in Karelia, near the areas where the Finnish folklore of ancient times was collected. Missing a good alternative, I’ll propose that Lake Yanis in Karelia, is falsely interpreted as an impact structure, and is the location. Aule (with the help of Iluvatar) must have snatched Erebor, along with her inhabitants away from this Earth. Checking the areas of massive changes to the Middle Earth thus far described, leaves us a relatively stable area of Brown Lands, so the mixed people that was generated here, the Kurgans, were strengthened and are now, by some, interpreted as a birthplace of much of European cultures. After these huge changes, the real one and the ones produced by the difficulties in map making, our map of the Middle Earth looks like the following. Without the knowledge of the projection used in the map of the Middle Earth, it is impossible to know how distorted the areas on edges of the map are, I have thus limited the correction of the distortion somewhat, partly also due technical reasons. The discovery of more exact correspondences between maps of Middle Earth and Europe is left to later and better cartographers. On the map, I have left the southern part of Misty Mountains to their original location, so the readers can more easily equate the modern and third age locations. It can be though quite easily shown (oh yeah) that their size corresponds quite exactly the size of the mountains still missing in the modern European map. On the next part, that is maybe the second to last one, we’ll wonder how on Earth we can fit the British Isles to the location we have been told, and we’ll ask if this is necessary, on these times after the 1950s.